Finally after 4 attempts it’s GAME ON! Originally scheduled for December 10th last year Cambridge United WFC finally meet Coventry United Ladies in the last 16 of the FAWPL Cup. The good old British weather putting pay to this fixture 3 times! Along with the Christmas break and Coventry United Ladies playing in both the FA Women’s Cup and County Cup has seen this game long delayed. 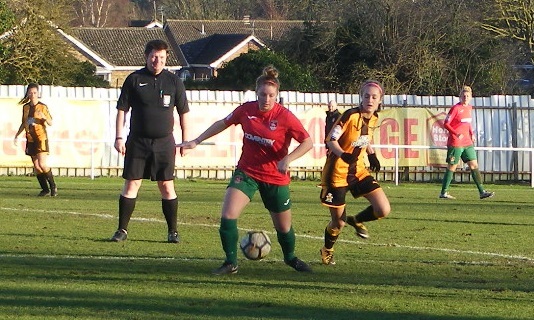 Better weather at last this Sunday at Mildenhall Town FC as these two sides play for a place in the quarter finals of the FAWPL Cup an away trip to in form South West Division One side Plymouth Argyle Ladies waiting. 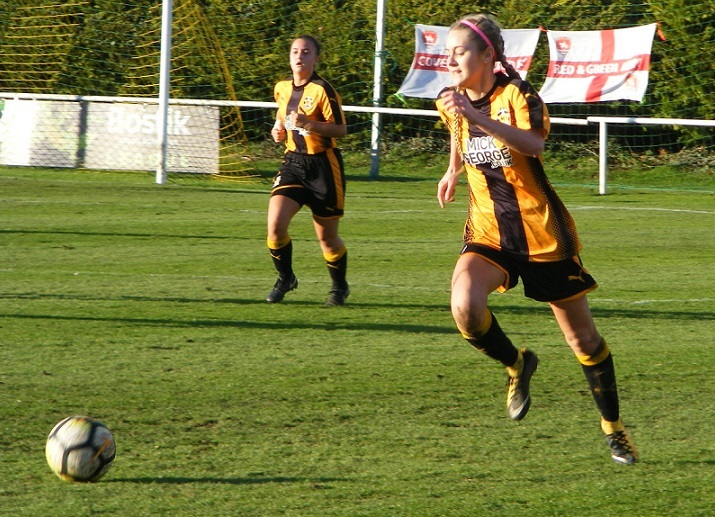 A test for Cambridge United WFC 6th in FAWPL South East Division One taking on higher league opponents this afternoon. 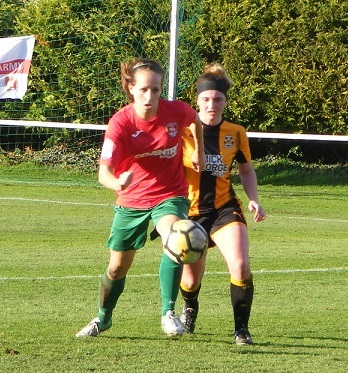 A Determining Round played at the start of the season the winning sides entering the Cup competition Cambridge United WFC went on to beat fellow league side Enfield Town Ladies 2-0 to reach the 2nd Round. Manager Steve Edwards leaving the club after 4 years in charge of the 1st team since then. Reserves and former 1st team manager Kevin Hoover taking over whilst the club look for a successor. Coventry United Ladies looking as strong as ever at the start of 2018, 5th in the FAWPL Southern Division but with games in hand on the leading pair Charlton Athletic Women and Crystal Palace Ladies whilst still in contention in 3 cup competition’s the County, FAWPL and FA Women’s Cups. FAWPL Plate winners 2 season’s ago are unbeaten in 6 matches in both league and cup going into today’s tie. Mildenhall Town FC the venue for today’s game like many others across the country has seen it’s far share of water these past few weeks, despite that looks once again in great condition if not quite a dried out as preferred this is the 52nd match to be played upon it so far this season. A sloping pitch from one goalmouth to the other, the sun bright in the sky beginning to fall behind one end. Positively tropical conditions as a pose to the freezing monsoon I endured during last weekends game, bright and sunny a strong breeze blowing across the pitch as the two sides emerged from the dressing room ready to go. 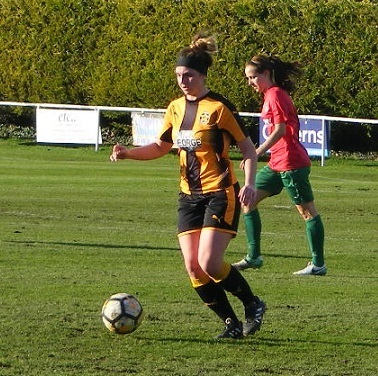 Cambridge United WFC starting XI – Shayla Burgess, Emma Jenkins, Carrie Bennett, Kayleigh-Anne Burt, Laura Bright (C), Charlotte Crisp, Amber Cantwell, Amy Howlett, Faith Hewitt, Lauren Cartwright & Kelley Blanchflower. 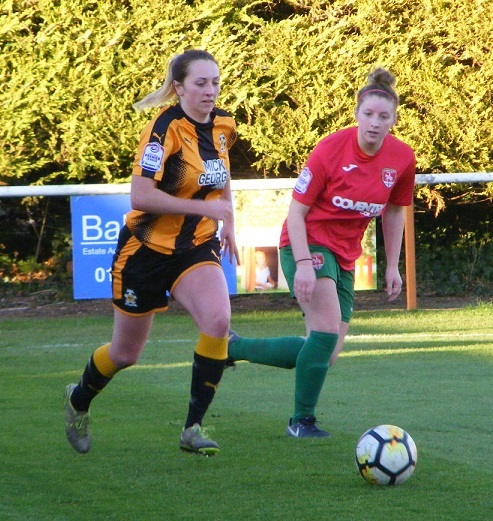 Subs – Laura Baker, Lauren Gibson & Gabrielle Whitehurst. 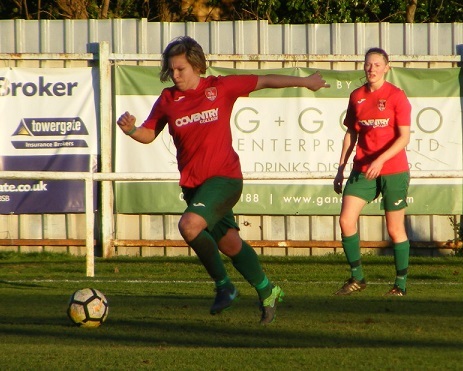 Coventry United Ladies starting XI – Susan Wood (C), Alexandra Buck, Nikki Miles, Natalie Haigh, Maisie Jerrim, Laura Cooper, Helen Dermody, Jade Brook, Amber Hughes, Marie Gauntlett & Alison Hall. Subs – Elizabeth Steele, Jessica Lundie, Lucy Stead & Rosie McDonnell. Good to see Carrie Bennett back in the starting line-up for Cambridge after suffering a nasty dislocated elbow on the final day of last season. 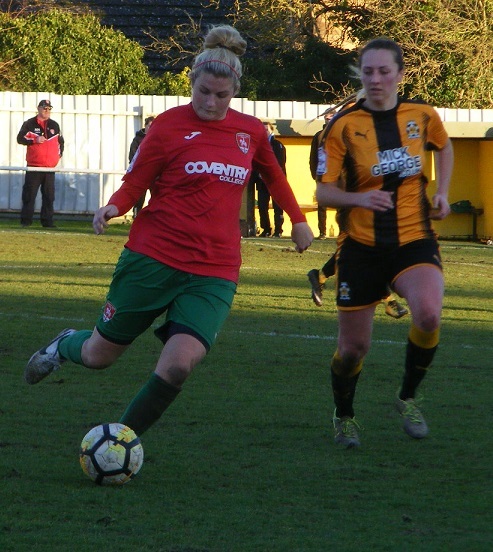 Up front Kelley Blanchflower leads the line for the home side having been out for a period too with injury. For Coventry United Ladies, Nikki Miles is making her 130th appearance today. Cambridge wearing amber and black vertical striped shirts with black shorts and socks to kick-off the first half the sun in their faces with Coventry wearing red shirts with green shorts and socks attacking up the slope. The visitors press the ball right from the off Laura Cooper winning it in the middle the ball played out to Amber Hughes on the right her ball in cleared by the Cambridge defence. Maisie Jerrim takes a knock for Coventry as she goes up for the ball with Kelley Blanchflower as Cambridge play the ball long up towards her 25 yards from goal, going after the ball Blanchflower wins a free-kick central for Cambridge play stopped so Jerrim can receive treatment. Off the field Cambridge captain, Laura Bright comes forwards to take the free-kick around 25 yards from goal floats the ball in towards the far post players attack the ball, Coventry winning the header the ball clearing the area comes back to Bright she shifts it and shoots her effort wide of goal. Jerrim returns to the field for Coventry, Helen Dermody with the ball in the middle plays it on for Jade Brook ahead of her, Brook passes it on for Alison Hall at the top of the box right side puts a cross into the middle, Bright intercepts clearing for Cambridge. Coventry have started well players forwards, a shot comes in from distance, Shayla Burgess on loan from Watford in the Cambridge goal makes a very good save getting up to tip the ball up over her crossbar. The resulting corner played in from the right a good delivery from Dermody across the face of goal is headed clear by Bright for Cambridge. GOAL! Coventry’s good start brings an early goal as they open the scoring in the 9th minute. Possession with Marie Gauntlett on the left side powers her way up the line holding off her marker whips in a great cross towards the near post, Hall arriving on cue to head the ball in across the keeper to make it 0-1. Brave goalkeeping from Burgess soon after prevents Coventry from doubling their lead regaining the ball from the restart push players forwards a good diagonal ball along the ground finds Hughes getting into the box behind the Cambridge defence, Burgess reacting quickly to slide in a smother the ball at the attackers feet. Hughes finding room out wide right again cuts inside sees her shot blocked by Bennett from outside the area. A strong midfield run from Brook as Coventry come forwards again a corner won on the right another good delivery from Dermody into the six yard box, the ball attacked and headed down towards goal, Burgess from close range making a fantastic double save, stopping the initial effort then blocking the rebound. The home side under pressure early on. Coventry have another corner right side this effort caught up in the breeze dropping near post defended by Cambridge out of the area dropping to Cooper 20 yards out puts her foot through the ball her effort blocked. Cambridge are struggling to settle early on find any meaningful possession as Coventry quickly move the ball around. Little for Blanchflower to work with up top the striker knocking the ball on as both Lauren Cartwright and Cantwell get beyond her into the box look to pressure Coventry, goalkeeper and captain Susan Wood able to kick the ball clear. 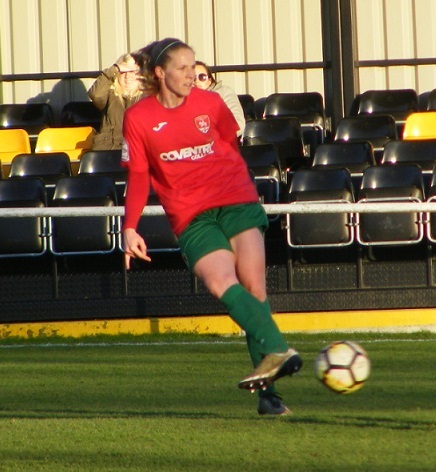 Brook carries the ball forwards for Coventry getting a shot away from 25 yards out her low strike gathered cleanly by Burgess. Jerrim intercepts the ball at the back for Coventry as Blanchflower looks to square a cross from the left along the top of the area, up field for Dermody she tries to release Alexandra Buck on the right the full back fouling Hewitt as she tries to get around her. 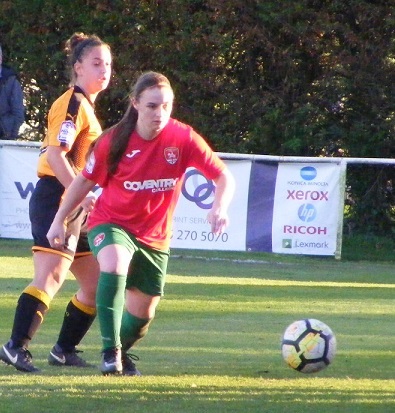 Not long before Coventry have the ball again moving it on Hall on the right swings a cross into the box, Kayleigh-Anne Burt winning it for Cambridge. Dermody starts and finishes another attacking move for Coventry bringing the ball up into the Cambridge half plays it out wide for Hughes on the move on the right wing her cut back along the top of the area met by Gauntlett who sends the ball on for Dermody continuing her run pulls the trigger her shot straight at Burgess the keeper holding onto the ball. Half an hour played and Cambridge have a great chance to pull it back to 1-1 Blanchflower putting pressure on the Coventry defence races onto the ball inside the box left of goal closing down Wood looks to lift the ball over the keeper sees her effort kiss the crossbar ad run out of play. Cambridge opportunities are restricted however as Coventry continue to press players forwards keeping Blanchflower isolated. Between the Bennett and Hewitt stop Hughes on the right getting a cross into the area. Cleared the ball soon comes back an early cross in from the right cleared by Burt at the near post. A free-kick for Cambridge wide left on halfway as Amy Howlett is brought down. Bright on the ball a good delivery up towards Blanchflower at the top of the area, seeing the ball down across her body intends to turn and take it on into the area, Natalie Haigh reads her intentions and not getting too close comes across to put in the tackle. A free-kick up the other end in a dangerous position outside the D for Coventry as Brook is brought down. Cooper over the ball gets her shot in past the wall heading for goal Burgess shuffling across quickly is able to get her gloves on the ball push it away. Gauntlett on the ball for Coventry coming inside to receive the ball from the left splits the Cambridge defence with a great pass as Hall through the middle beats the offside trap, Burgess with a good starting position however is quickly out of her area to win the kick and clear for the hosts. Late into the 1st half Cambridge get the ball forwards Blanchflower taking it down into the left corner the ball played back up towards the top of the area Charlotte Crisp with the header down looking to put the ball into the path of Cartwright inside the box, the Coventry defence getting in front of her to shield the ball back to Wood. One last attack in the 1st half for Coventry Brook with the strike from 20 yards out sees her effort charged down by Burt. A strong performance from Coventry in the 1st half. With much of the possession and certainly more chances they will be disappointed not to be leading by a larger margin. Conceding an early goal the game threatened to get away from Cambridge, some excellent goalkeeping from Burgess keeping the score down at 1-0 Cambridge are still very much in the tie however will need to have a much better 2nd half and find some meaningful possession on the ball having not settled at all in the 1st half. No changes for either side at the start of the 2nd half, Cambridge with the kick-off as Coventry attack down the slope the sun settled lower in the sky. Coventry come forwards the ball played up to Hall on the right is clattered into going to head the ball is left in a heap as play goes on the ball taken down the line swung into the box claimed by Burgess at her near post. Hall is back up on her feet. Cooper with the diagonal ball to pick out Hughes making an attacking run down the right taking the ball on plays her cross in long to the far post attacked the header is narrowly over, either way play is stopped by an offside flag. Gauntlett running with the ball central lets fly from all of 35 yards out her strike sailing over the crossbar. Hall flings her arms up in the air inside the box wanting a penalty for Coventry as the ball into her is intercepted, the referee not interested. GOAL! As with the 1st half, Coventry score early to double their advantage in the 2nd. Play is over on the left side of the pitch as Coventry build an attack the cross played on towards the area Brook getting to the ball before Burgess can come to clear knocked past the keeper a defender attempts to get back to clear the ball but in vain as it rolls into the back of the net 0-2. A change for the visitors Jerrim comes off at the back with Rosie McDonnell coming on. Going in on the left side of defence Miles moves forwards into an advanced position on the right, Hughes coming over to the left. Buck defends well against Blanchflower at the back for Coventry as Cambridge send the ball long for her to attack. Setting up a counter attack the ball helped on by Cooper is picked up by Hall 25 yards out hits a venomous shot in towards goal from 25 yards out the ball skimming the top of the crossbar. 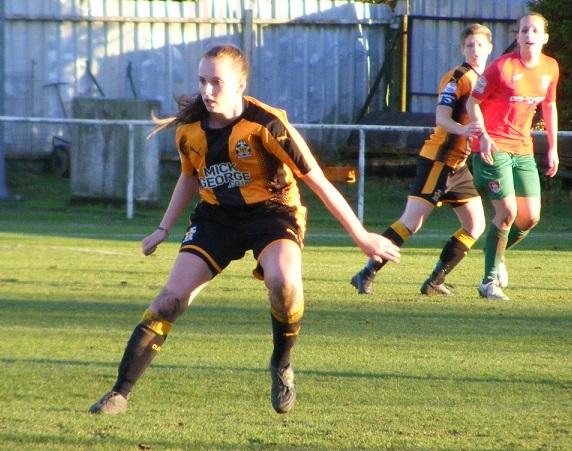 Burt clears with her head for Cambridge as Coventry get the ball in from the right wing. A good tempo to the game Coventry continuing to push players forwards a few strong challenges coming in. A corner right side for the visitors flung in near post a crowd up to attack the ball put wide of the post a goal kick the end result. GOAL! Coventry extend their lead 15 minutes into the 2nd half players up for a corner taken by Dermody on the right the ball cleared out to the left side, Coventry keep possession Cooper with the ball puts in a fantastic cross from the left up jump Haigh in the middle of the box to power her header into the back of the net, Burgess no chance to react 0-3. Cambridge make their 1st change of the game, Laura Baker coming on for Cartwright. Good link up play between Miles and Hughes on the right the latter putting her cross wide beyond the far post. Baker with a strong tackle stops Gauntlett as the Coventry attacker looks to push on through the centre. Coventry have the ball in the back of the net but are denied a 4th goal by the offside flag following good build up play from Cooper out to Miles on the right the ball squared into the area Gauntlett running onto it puts the ball in just inside the post only for the effort to be ruled out. Blanchflower is taken down by Buck as she looks to bring the ball on into the Coventry half the set-piece in a central position Cantwell over it looks to lift the ball up into the box to be attack, runners closing Wood down she claims comfortably. A 2nd change for Coventry up top Jessica Lundie comes on to replace Hall in attack. A brilliant save from Wood prevents Cambridge from pulling a goal back as the ball is played up field into the box the clearance runs straight along the ground into the path of the advancing Baker 25 yards out she hits it straight back in towards goal racing for the bottom corner Wood dives full stretch to her right to push the ball behind her goal. From the resulting corner on the left side it’s Brook who gets her head on the ball to clear for Coventry. Gauntlett passes the ball inside for Dermody to her left 25 yards out central her 1st time shot is charged down inside the box. GOAL! Cambridge have pushed up as they look to get players forwards are hit on the counter the ball cleared back up field Burgess comes racing out of her area to try and win the bouncing ball getting her head on it fall straight into Brook breaking forwards 40 yards out knowing there is a open goal lobs the stranded keeper sees the ball bounce down over the line 0-4. Coventry keep coming forwards putting Cambridge under constant pressure, Miles demanding the ball on the right getting onto space linking up well with Brook. Dermody comes close yet again with another strike from distance central her shot striking the crossbar. A free-kick giving Cambridge a chance to get the ball forwards, Bright’s ball is headed on by Baker into Blanchflower looking to turn into the box is again closely watched by Haigh. Not long left to play now Coventry make their final change Elizabeth Steele coming on to replace Hughes. Cantwell breaks forwards for Cambridge the ball in for Hewitt up the left wing her cross into the box looping up is over Blanchflower making a central run, Coventry clear. GOAL! Into injury time at the end of the game and Coventry score again, substitute Lundie putting the ball past Burgess from the left inside the box as she receives it from Gauntlett attacking down the right 0-5. Coventry finish the game as strongly as they started it pressing numbers forwards to the final whistle winning the game 0-5 to set up an FAWPL Cup quarter final away to Plymouth Argyle Ladies. The tie scheduled for Sun 11th February. A dominant performance from the visitors today. Coventry getting off to a great start and keep up a superb all round team performance all game. Getting players forwards good runs on and off the ball causing Cambridge problems and cool at the back when their opponents were able to get forwards. One of those days for Cambridge never really got into the match early on as Coventry prevented them getting forwards, Blanchflower having little to feed on up top. Still keeping the score down to 1-0 in the first half gave them hope of getting back into it 2nd half ultimately not to be as their cup run is over. On to the next game. Interesting one today for the Women’s Football East – Player of the Match always a tough choice when you have such a good all round team performance Coventry were strong all over the pitch but particularly in midfield where their attacks often began Gauntlett and Hughes providing good runs left and right, Cooper and Dermody finding them on a regular basis, have all just been edged out by Jade Brook who made some purposeful runs forwards aswell as getting on the scoresheet twice making her today’s Player of the Match. It’s nice to not feel like a block of ice after a game, roll on summer, my thanks to both clubs for their assistance today is always appreciated. 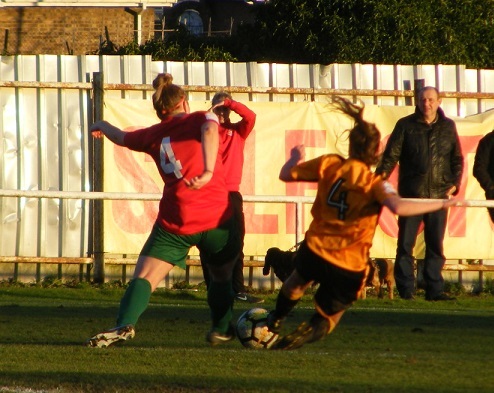 This entry was posted in FAWPL Cup, Match Reports and tagged Cambridge United WFC, Coventry United Ladies, FAWPL Cup, Match Report on January 28, 2018 by WFEast.